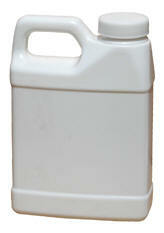 Rectangular Plastic Jugs Jugs for use in industrial and commercial applications. Ideal for storing or transporting a variety of liquids. Lightweight, natural color, FDA compliant high density polyethylene (HDPE) construction. HDPE closure with EVA liner. Specs: Rectangular, Uniform Cap. 160z, 320z, 64oz, and 1 gal., Cap Color Natural.